Want more of those delicious and crispy fries? Thanks to DC Biofuels, the tasty french fry in Washington DC may linger on a little longer – fueling the vehicle fleets in the district as the capital area’s very own biodiesel facility plans to open next year! Biodiesel is a clean burning alternative fuel, produced from domestic, renewable resources. Biodiesel is produced from any fat or oil through a process called trans-esterification. The DC plant will recycle used animal fats, vegetable oils & greases (FOG) from urban waste streams. A healthier, cleaner-burning fuel to petrol and diesel. 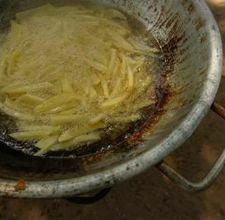 It can be produced from waste grease. It can be used interchangeably in any diesel application, with little or no modifications. Biodiesel is a non toxic, non flammable, biodegradable product unlike dirty diesel. It enables sustainable local economic growth and eases our dependence on foreign oil. Where will all the grease come from? DC has plenty of it. DC Biofuels already has a tie-up with the Neighborhood Restaurant Group (NRG) to supply the waste grease from DC restaurants. This relationship is great for restaurant owners as they currently pay grease haulers to dispose off the grease. With the new arrangement, DC Biofuels will pay the haulers to collect the grease with no cost to owners, making this a viable business proposition for participating restaurants. Initial plans are to produce “clean & green” biofuel for centrally fueled public and private flees. The DC Biofuels state-of-the-art production facility will process multiple FOG feedstocks, including “waste” vegetable oils (WVO), yellow grease, and brown grease, producing high-quality biodiesel (ASTM D 6751) and will be BQ900 certified. The facility will blend biodiesel with Ultra Low Sulfur Diesel (ULSD) that meets ASTM D 975 specifications based upon a customer’s requirements. DC Biofuels is a proposing a 20:80 ratio for biofuel:diesel mixture just because current vehicular warranties allow that ratio. The finished blend will be treated with NOx-reducing & other performance-enhancing additives. DC Biofuels has gathered a lot of interest from the DC government and surrounding local governments to fuel public fleets. Though the DC government is not involved in the project establishment, they are offering tax incentives to the company on the basis of the jobs it will create in DC owning to the factory location within the city. With the biodiesel facility, Jenkins plans to engage and employee DC residents and help the biodiesel revolution in the area. San Francisco is a leader in utilizing used grease to manufacture biofuels with the successful SF Greasecycle program though the model in DC will be different. While San Francisco’s program is state and city supported, DC’s plant will be privately owned and maintained. Can A Landfill Generate Renewable Energy in its Afterlife?